We can assist you in making minor kitchen updates or performing an entire kitchen remodel with a timeless design that you will love. Finish Selection: We will help you select all the finishes so that your cabinets, counter-tops, appliances, flooring, lighting, back splash, and accessories compliment each other. We work with showrooms to offer a complete selection of everything you need for your kitchen renovation. From traditional to modern and every price level from very basic to completely high end. We can create any kitchen you can imagine or even reproduce anything you’ve seen in any magazine, showroom, or web site. Kitchen Cabinets: We can supply any cabinet in any style, material and finish including standard and special order hardware. If you would like to install your own cabinets and wish to purchase the cabinets at our contractors pricing, we can offer you tremendous savings with our custom cabinet builders. Counter-tops: All granite, marble and natural stones. Solid surface, quartz countertops, wood, stainless steel and other specialty surfaces. 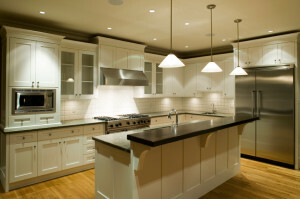 Contact Us for your Kitchen Remodeling Project by clicking here.